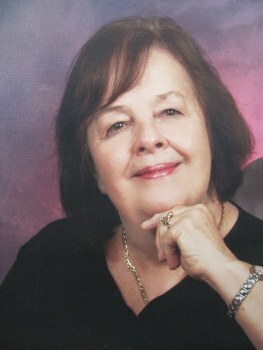 Charlotte Hendrix Griffin, cherished wife and Oma, passed away on Dec 27th, 2012. She was born September 3rd, 1930 in Miami to Earl and Bessie Hendrix. She graduated Orlando High School in 1948. She married Francis Dillman Griffin in 1949. Soon thereafter the newlyweds moved to Atlanta to attend Georgia Tech. In 1958 Francis got a job in Huntsville, Alabama with NASA. They were members of Southside Baptist Church in Decatur, Alabama. Charlotte sang in the Church choir and was also president of the Women’s Club. As the Space program accelerated they were transferred to Merritt Island, FL in 1965. There they became active members of the First Baptist Church of Merritt Island. She was a Soprano in the choir and a frequent soloist. She also taught special needs children and worked in drama ministries. Among many life accomplishments, Charlotte was a successful local artist. 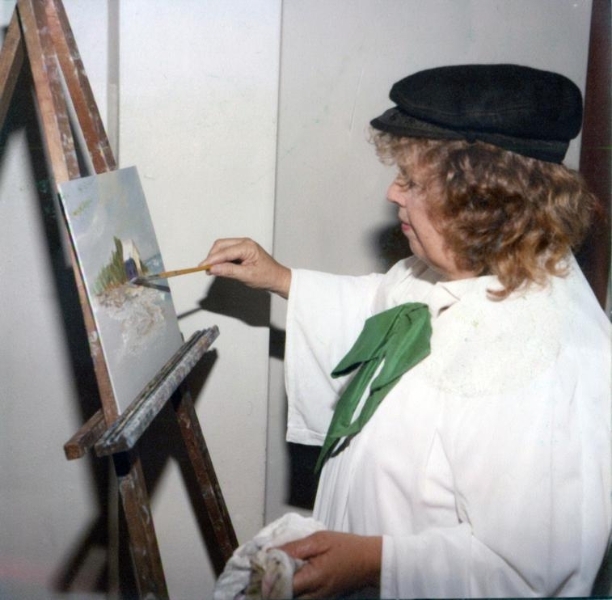 She taught painting at her studio and gallery, Cousins II, in Cocoa Village and was a frequent judge at annual art shows. She was a co-founder of the Musical Theater of Brevard and a past member of the Brevard Opera Arts Association, singing and acting in many local productions. 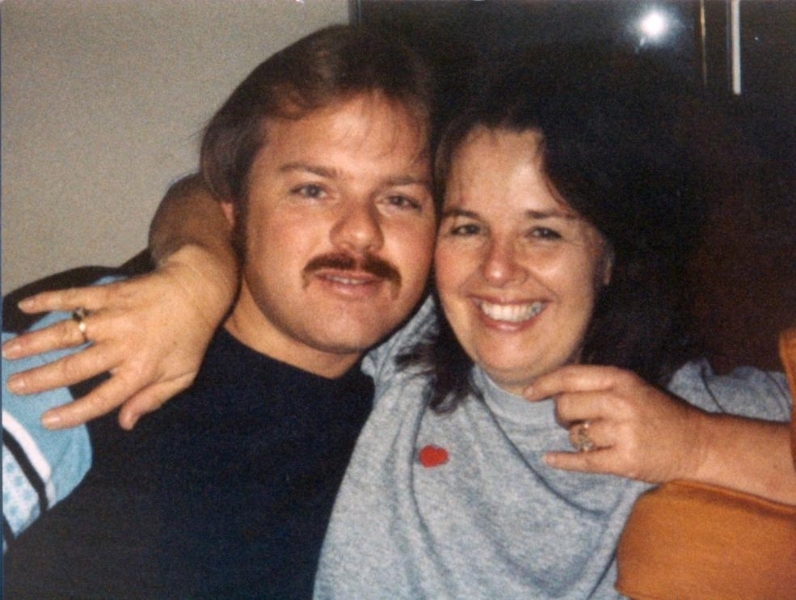 Charlotte is also survived by her sons Michael, Steven and Charles, Her brother Harold Hendrix (Rosemary), her cousin Arleene Westman (Robert), grandchildren, Marisa, Allyson and Kelly, great-granddaughter Dannikah and many other loving family members. Charlotte had many close friends, students and colleagues. Thank you to all who were a part of her remarkable life. Mrs. Charlotte ! I’ve wondered where you were for so long! Every craft fair i would think of you anytime i go to Cocoa Village I think of you and the wonderful memories i have of your art class in that old house! I think of how terrible it was when you were kicked out of there after teaching art there for so long! I always loved art but I’ve never been good at it. You would tell me i only needed practice. You taught my sister and her generation as well as i mine. Thank you for the cherished memories! I saw you a few years ago coming out of Olive Garden.. i wanted to say hi but i was unsure if you would remember me. I see now after wondering where you’ve been that you are painting for Jesus! How amazing! You are probably painting the best portraits up there and singing with the angels! I love you Mrs. Charlotte. Condolences to your loved ones. I had my first art lessons with Charlotte. I have many fond memories of her. She will be greatly missed! My deepest sympathy goes out to the Griffin family. We are so sorry to hear about your loss. You and your family are in our thoughts and prayers. I’ve known Charlotte since I opened up a shop in the village. She has always been an inspiration to me. She always was so positive about everything. I enjoyed our little visits. I can’t beleive she is gone. I will miss her dearly. The village will not be the same without her. Love you. She has been in my life for so long, it will be very hard to adjust to her not being there for me to call and check on her. She will be painting her beautiful pictures in Heaven with our Lord! I love you Charlotte and God bless you always. My two boys were students in Ms. Charlotte’s art class many years ago in Cocoa Village. At the end of week party, we discovered she was also our neighbor. She was a was a lovely woman and wonderful teacher. We have been gone from the neighborhood for a couple of years now, but rember fondly trick or treating at Ms. Charlotte’s house. She always had a wave and kind word when we’d see her driving by. She will be missed. Charlotte Griffin had a profound influence in my life. A truly great lady I met back in the 70’s during the play “Everyone Loves Opal”, a play at Surfside Players (same play where I met John Lineberger). Charlotte was an incredible artist as well as a gifted actress and singer. I told her I couldn’t even draw a stick man and she invited me to her art studio where she showed me I didn’t have to. She taught me impressionistic oil techniques as we drank wine and painted to classical music. I went faithfully for many years until my babies, work, chores, etc claimed all my time and I took a 20-year break. A few years ago, I started painting again and lo and behold, Charlotte was still teaching! Again, I was spellbound by her talent and teaching style. I see her now in Heaven splashing the clouds with glorious color…THANK YOU for Everything, Charlotte! I sigh with sadness at the passing of this beautiful woman of God. For the 22 years that I have been honored to know her and Frank, I have seen great passion as she taught art, directed drama at First Baptist Church Merritt Island, and encouraged those around her. Charlotte was art teacher to all five of our children (Samuel, Susannah, Marshall, Caroline, and Isaac). Her summer camps were a great higlight with trips to the ice cream store, the day of art in her backyard, climbing in the tree house, and having so much fun. We celebrate the winsomeness and joy of this sweet soul and grieve with you her family. God gives good gifts and Charlotte is one of those. Charlott was such an inspiration during our Christmas Tree programs, Her talents and warmth are beyond measure. She will be leading God’s music. Charlotte was truly a gifted and amazing teacher. My three children were in her art class for homeschoolers many years ago. Not only did they learn a lot but they have talked for years about how much fun Mrs. Griffin’s class was and even expressed a desire to take lessons from her again…(as teenagers):(. So glad we went to visit her when we were in Cocoa village last summer. She truly loved her students and made each one feel special…..
Charlotte directed me in my first play at First Baptist Church of Merritt Island during a Living Christmas Tree. I will never forget that. She was a wonderful, talented and gracious lady. My thoughts and prayers go out to Frank and family. Tielle was a current student of Charlotte and we are very grieved at her passing. Charlotte introduced Tielle to the basics of art and took her a long way in a short time. She was extremely patient and understanding. We will always be grateful that she came into Tielle’s life when she did. She will make a wonderful angel. Charlotte was a part of my life for many years when I attended class on Tuesday nights. I learned so much from her. She was so talented, so kind and a wonderful teacher. She will be missed. We moved out of state over six years ago and often, when painting, I could hear her voice in my head telling me to STOP! And she was always right. On our first trip back to Florida, she was the first person I contacted and I am glad I was able to see her again. She will be missed by so many. So sorry to hear of Charlotte’s passing. Our prayers will be with you. Charlotte painted a picture for my son (Mike) that I still have on my wall. She did a lot of research to paint the picture just as Mike wanted for his birthday. It is cherished very much. Lots of happy memories of this wonderful lady! I took art lessons with Charlotte as a young girl and she taught me about art, and she taught me about life. As an adult I enjoyed seeing her at the grocery store and visiting with her. She will be greatly missed but her legend will live on in all of her students whose lives she touched and changed forever. Charlotte was a beautiful lady. I learned a tremendous amount from her art classes. she will be sorely missed. So sorry to hear of your loss, I knew Charlotte as Steve’s Mother and then as an art teacher in Cocoa Village loft where she began teaching Art. I also lived upstairs from her when she moved her Art Studio over to Delanny. I posed for her class and still have the paintings I did when she had the loft and one from posing that Jenny gave me! She was a very nice lady and I am so sorry for your loss. May God draw close to you all and comfort you in your time of grief. Our Thoughts and prayers are with you,Frank,Mike,Steve and Charlie. Please know we are saddened too. We loved Charlotte and all of you are in our prayers. You are all in our hearts & prayers. God Bless! I had just met Charlotte for the first time a few weeks ago. Her granddaughter, Allyson, had suggested I take classes since I was retired, had not sketched since high school, and this would be great fun. I was looking forward to get back into the arts and had a very pleasant time at her studio. I’m glad I had the opportunity to chat and am sad I will miss her instruction. Charlotte was a long time member of CBAA. 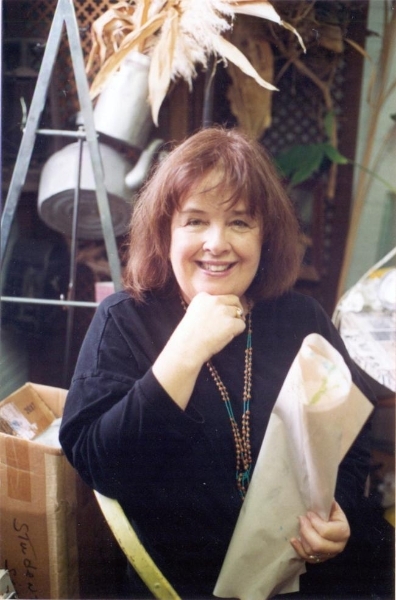 She participated in our Art shows and events in the 1970’s,80’s, and 90’s.. She taught art classes, workshops, and did demonstrations. 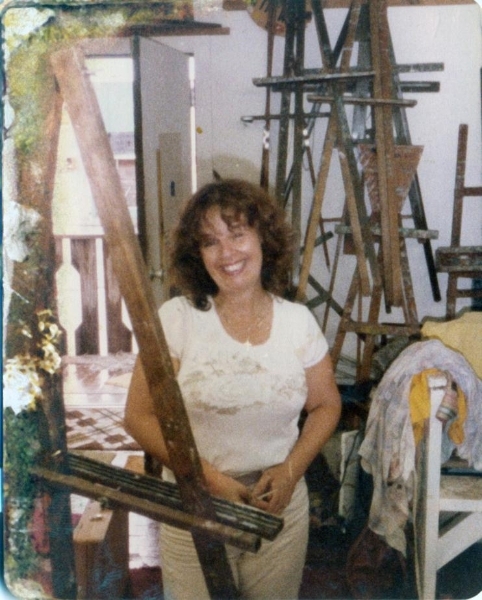 Her students loved her for her passion for art and the encouragement she gave as she taught art techniques and composition to those who aspired to be artists. She will be greatly missed by her art students and friends, but her art will be a living remembrance of her talent and sweetness. CBAA sincerely wishes to send the deepest synpathy to all her family . Pat Ubbink, President : CBAA Bd. of Directors and all Members.